Tarzan, this is your glampsite. 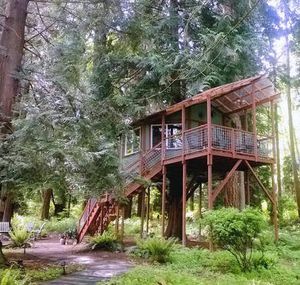 This spacious octagonal treehouse sits 14 feet above the ground in a cedar tree on the property of Ken and Lynn Berry, near Freeland on Whidbey Island. When the traffic and ferry lines are with you, you can arrive in 90 minutes from Seattle by car and the Mukilteo ferry. Windows and skylights bring forest light into the treehouse, but the forest keeps it cool — even in 90-degree weather, according to one guest review. “The forest just envelops you with this healing peace,” said Lynn Berry, a former nurse. 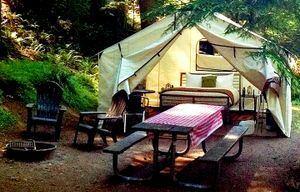 The 250-square-foot space has a queen bed, a hide-a-bed sofa that can sleep two, a desk, couch, lounge chair, and dining table. A microwave, fridge and beverage bar are provided. There’s also a TV for DVD viewing (player included) and a combination CD player/radio. Another table and chairs sit outside on a roomy covered deck. Another option on the property: a teepee that sleeps two. A beach walk along Mutiny Bay is a quarter-mile away. Popular hiking trails at Ebey’s Landing National Historical Reserve can be reached by car in 30 minutes. It’s a 5-minute drive to Freeland and 8 miles to Langley’s cultural attractions. whidbeywellness.com/?page_id=14. $145/night for two; $20 for each additional guest. $300 security deposit. Continental breakfast included. Two-night minimum. Children 12 and older allowed.